WikimediaPresident Richard Nixon being presented with a turkey at the White House. 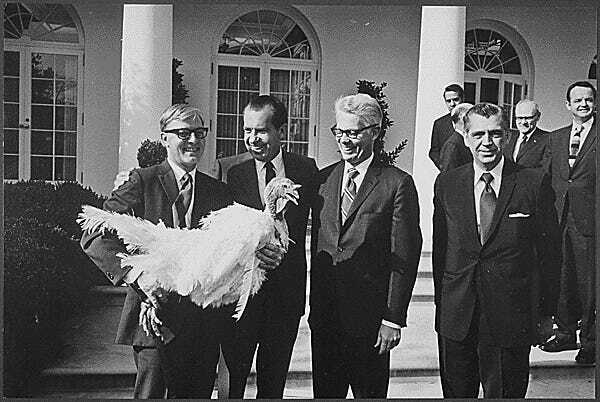 The tradition of the White House turkey pardon supposedly dates back to 1947 and President Harry Truman. However, one year it went horribly awry. In 2011, the Washington Post tracked down a longtime rumour that a turkey presented to President Richard Nixon had to have its feet nailed to a table for the occasion. According to the newspaper, the turkey was subdued this way because it was a “particularly rambunctious” bird. This tale was confirmed by an unnamed former Nixon administration staffer. “Regarding the effort to restrain the White House Thanksgiving turkey, it is my understanding that at least one year, they nailed its feet to the table,” the staffer wrote. Luckily for all involved, apart from a pair of apparently bored first daughters, this year’s ceremony went off without a hitch.